Today, we will continue explaining Power Factor Correction Capacitors Sizing Calculations Steps in detail as in the previous article “Power Factor Correction Capacitors Sizing Calculations – Part Five”, we only listed the Power Factor Correction Capacitors Sizing Calculations Steps. So, today we will continue explaining other steps for Power Factor Correction Capacitors Sizing Calculations For Existing Installations. Fig.1 shows the phases of Power Factor Correction Capacitors Sizing Calculations For Existing Installations. In this phase, we will design and select the best economical, efficient and applicable power factor capacitor scheme for an installation. Fig.3 shows a typical flow chart for the Design process. This step is used to find the lowest cost capacitor scheme that will adequately correct for the power factor while minimizing the losses. The lowest cost installations are generally fixed capacitors with few additional accessories such as automatic switches and harmonic filters. Therefore, the philosophy of this process is to start with a suitable fixed capacitor scheme and then modify it until the voltage and harmonic constraints are met. In many cases, it will be possible to meet the constraints without resorting to these additional items. It is also beneficial to start with more than one fixed capacitor scheme and see if it leads to a more economical outcome. Since we are encouraging placing capacitors throughout the plant to achieve more energy savings, a multitude of alternatives arise and there is no one "right" answer. Several schemes will work adequately. The challenge is to find one that is acceptably close to optimal. How to Develop a Fixed Capacitor Scheme? This will eliminate the power factor penalty, but will not reduce the losses within the plant. One lumped bank is also the configuration most affected by harmonic resonance because there is less damping than when the capacitors are distributed throughout the plant. 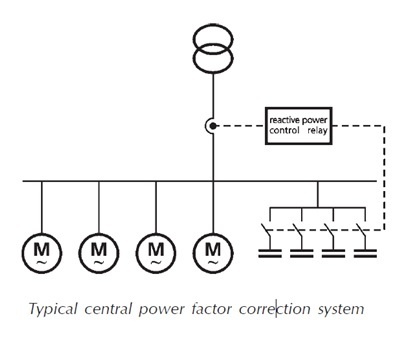 Please check the title "Central Compensation" in article "Power Factor Correction Capacitors Sizing Calculations – Part Five". Lacking better information, this will generally achieve a good capacitor scheme with respect to losses, although, it may be not optimal. 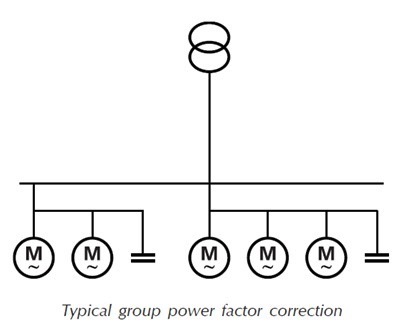 Please check the title "Group Compensation" in article "Power Factor Correction Capacitors Sizing Calculations – Part Five". This procedure is acceptable, but does not reflect the need for more released capacity or loss reduction in another part of the plant. Capacitors sized for small motors are often proportionately much more expensive than larger fixed capacitors because of installation costs. We found in the case studies that for moderately to heavily loaded systems, most of the loss savings are achieved in the cables and transformers feeding the motor control centers. Therefore, the procedure here begins with a fixed Capacitor installation at the motor control centers. Then, if there is a need to switch the capacitors, we will consider installing them on motors. Of course, capacitors on larger motors are often as economical as fixed banks of similar sizes. 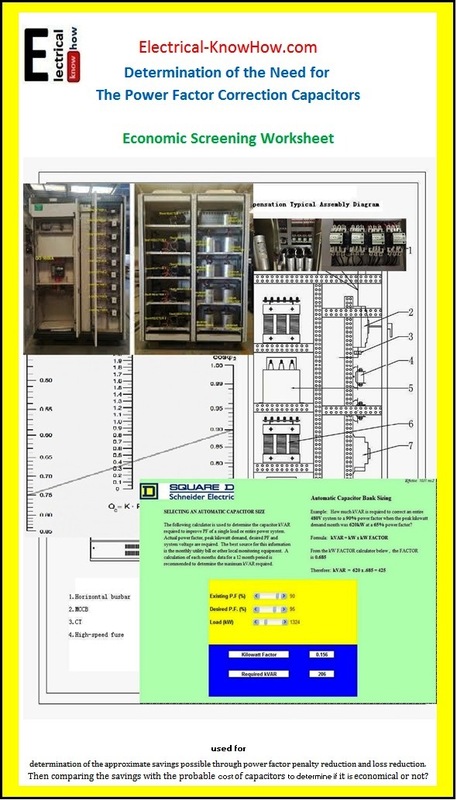 Please check the title "Individual Compensation" in article "Power Factor Correction Capacitors Sizing Calculations – Part Four". 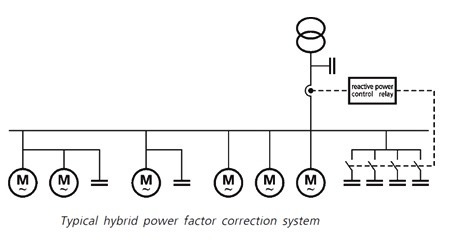 Please check the title "Hybrid Compensation" in article "Power Factor Correction Capacitors Sizing Calculations – Part Five". How to select the best Economical Capacitor Scheme? Choose one of the techniques above to select a capacitor scheme. Distribute the capacitors over the plant. If you have access to a computer program for this purpose, it can do this for you while taking into account different loss densities in the plant. You may wish to go out for bids on the different schemes to get an idea of the costs. Because of the competitive nature of the capacitor market, there can be a wide range in prices. Generally, small capacitors are more expensive on a $/kvar basis than larger ones. This step is used to check that if the Voltage Constraints Met or not. The basic reason why many plants cannot leave fixed capacitors energized continuously is that the voltage increases too much when the load is low. The limit on the steady state voltage is generally about 110%. Above this limit, the transformers will saturate and become overheated. Of course, the life of incandescent lamps is also drastically reduced. If we assume that the normal system voltage could be a 105%, then the capacitors should cause no more than a 5% rise at no load. Fortunately, at many plants where this could be a problem, the load seldom drops low enough. Or, if the load is de-energized the capacitors are also de-energized. However, if these conditions can't be guaranteed, some or all of the capacitors will have to be switched. Calculate the voltage rise that will result from applying a 350 kvar capacitor at the secondary of a 1000 kVA transformer with an impedance of7%. Also, from the following curve (fig.8) you can find the % voltage drop for any power factor improvement. 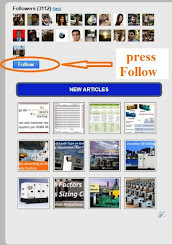 Improve power factor from 60 percent to 90 percent, calculate the reduction in voltage drop. 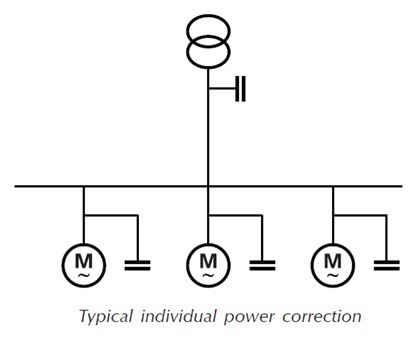 You can review article " Power Factor Correction Capacitors Sizing Calculations – Part Four" to know when and why we need to use one of the above switching schemes. This step is used to check if the harmonic Constraints Met or not. Once a capacitor scheme has been selected that meets the power factor and voltage criteria, the harmonic distortion must be estimated. If the estimated current in the capacitors exceeds 135% rms or the bus voltage exceeds 5% THD, some form of mitigation is required. Measure the maximum voltage distortion at the plant main bus without capacitors. This is done with a meter capable of reporting the individual harmonic values. Apply the distorted source voltage to a model of the plant circuit and compute the currents in the capacitors. Add about 20% more capacitance to move the tuning frequency lower. This continues to meet power factor requirements. Then the no load voltage and capacitor switching options must be reconsidered. Try a smaller amount of capacitance. This will also move the tuning frequency, but could result in not being able to completely eliminate the power factor penalty. Use filters to control the harmonic distortion. 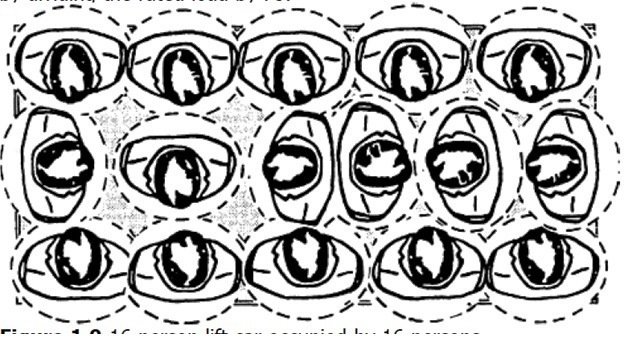 The first filter design to attempt is to convert one of the larger capacitor banks into a filter for the lowest harmonic of interest. In most industrial plants, this is the fifth harmonic, but is sometimes the third. If additional filters are needed, they are added for the next highest odd harmonic of any significance. If there is a concentration of harmonic sources, the logical bus for the filter is the one supplying that portion of the plant. Since the filter must be sized sufficiently large for the bus capacity so that it doesn't bum up due to the bus distortion, some capacitors originally planned for other areas of the plant may have to be combined with the filter bank. 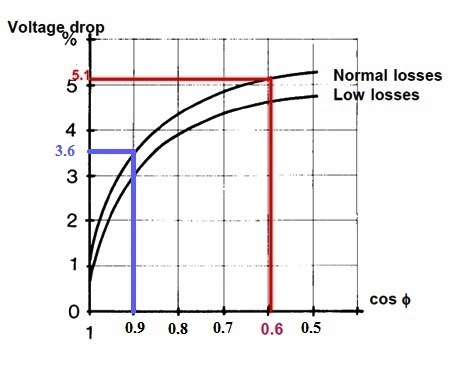 This may sacrifice some of the loss reduction, but is the often the price that must be paid for achieving successful operation in the presence of harmonics. After selecting a filter design, the new scheme must again be evaluated for no-load voltage rise and other harmonic problems that may crop up unexpectedly. Later, this option will be explained in detail. Use an automatic power factor controller to avoid the resonant conditions. If the capacitor steps that cause resonance can be predicted ahead of time, the controller can simply be set up to avoid those steps. It is also possible that the vendor can supply an adaptive control scheme that watches, the harmonic distortion and automatically changes capacitor values when the system distortion gets high. How to select between different Mitigation options? If you select the first option, a small cost for increasing capacitance by 20% will be added. If you select the second option, you must accept a small power factor penalty. If you select the third option, filters' cost may be assumed to double the cost of the capacitors incorporated with them. If you select the fourth option, a cost will be added for the automatic power factor controller. For a number of reasons, selecting different capacitor sizes (as in 1st & 2nd options) may not be a practical consideration. One common reason is that a number of capacitors are being switched at random and there are several combinations that could yield trouble. For estimating purposes, you may wish to obtain more exact costs by contacting vendors because costs do vary significantly. If not, try to improve the economics by developing lower cost Capacitor Scheme solution or abort the design process. How to Develop Lower Cost Capacitor Scheme Solutions? Check with power factor capacitor and filter suppliers to learn if there are more economical combinations that have not been considered. It may be possible that by sacrificing some power factor correction or loss improvement, a much less costly installation may be achieved. it may be economical to install a few large capacitor banks while it is not economical to install several smaller ones distributed throughout the plant. it may be possible to combine several capacitors under one power factor controller rather than having several controllers. Consider putting the capacitors at a higher voltage level, if available. Many industrial plants have 4 to 15 kV circuits as well as 480 volt circuits. Of course, there is considerably more energy to be saved on the 480 volt circuits, but the capacitors and filters on the higher voltage systems are often much lower per unit cost. At least, the power factor penalty may be saved. Look at the root cause of the problem. If it is harmonics, is it possible to mitigate the harmonics in some other way? Can the capacitors be tied in with other plant improvements that would make it economical to install a practical scheme? step-down transformers that are too small may be the root cause of having to switch the capacitors because of the no load voltage rise. Consider upgrading the transformer. In the next article, we will start explaining steps for Power Factor Correction Capacitors Sizing Calculations for New Installations. Please, keep following.